Buy online shopping Websites like Medplusbeauty, flipkart, slassy, purple, Snapdeal etc. Street wear Eyeshadow Bombshell comes in a round flat plastic package with slide and lock system. This is very cute and travel friendly. The shade is bronze or neutral brown with shimmer. It is very much pigmented and the colour payoff on my brown eyelids is really great. I didn't find any significant smell from this eyeshadow, the texture of this eyeshadow is creamy. I am going to finish this eyeshadow soon, because I am using it whenever I go outing. I found it is easy to use, I am very lazy person to use eyeshadow brushes and all. I will just swipe this on my eyelids and spread all over the area of lids, that's it finished. This creamy texture is easy to spread and never had any tugging problem. This shade especially gives a gorgeous look to the eyes in an easy way. This eyeshadow doesn't crease much on my oily eyelids. but in the crease portion of the eye this eyeshadow creases slightly. This eyeshadow never fades off on my eyelids until I wipe it off by a cleanser. I think this shade will look more intense and different on fair eyelids. 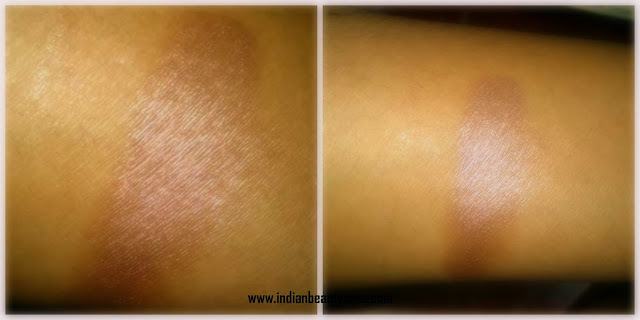 But, for my brown eyelids this looks very cool and as a neutral brown shade more than a bronze effect. But, I have read some bad reviews about the other shades from this same range. Other than this shade all the 2 other shades are total duds. Thank God, I got this one luckily, also didn't buy them. This shade is totally worth and it is best for it's price. If there is no shimmer this could have been a best eyeshadow base. But, I use it as a eyeshadow base for related shades somewhat it is working fine. Shimmers doesn't looks more visible. Easy to apply, suitable for dry lids very much. Can be paired with other shades easily. This may not be a neutral shade for fair complexion. Creases on the eyelids crease potion slightly. Availability, am not sure about offline stores. Street wear Eyeshadow Bombshell is a gorgeous shimmer bronze which gives you a gorgeous look easily. But, other shades from this range are duds. Do give a try on this shade, this is totally worth. I have seen it at purplle.com.